A heartfelt 50th birthday gift inspired by vintage English silverware, this Florentine heart necklace combines flowers and scrollwork, is pierced in one corner and held with an elegant adjustable chain. 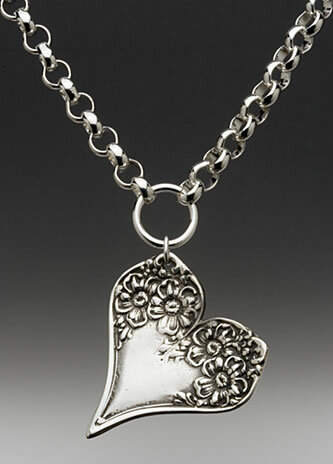 From the vintage collection at Silver Spoon Jewelry, this piece has the look of the 1900s English silverware inherited by Silver Spoon designer Jennifer Northrup. It's cast in brass, dipped in sterling silver, then oxidized with an antique finish.